When I pulled out the fabrics for this quilt I was initially thinking how fun it would be to work with colors that are a little out of my comfort zone. But then it occurred to me that you are much more likely to see me wearing these colors in real life than the bright ones that I normally sew with. So this quilt is more "me" without being what I usually sew if that makes any sense at all. 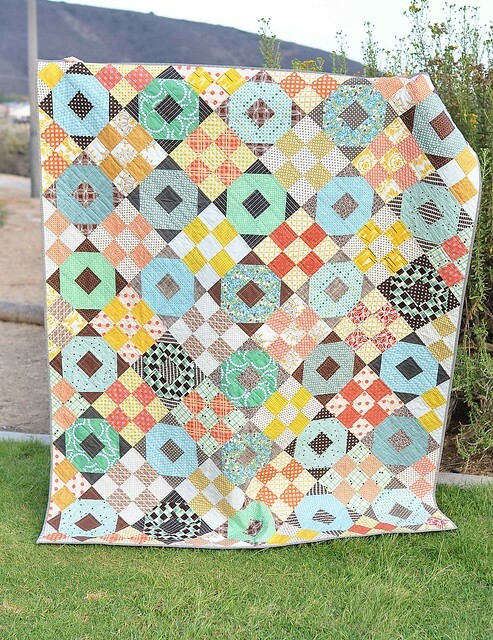 The colors for the quilt are based on Denyse Schmidt's newest collection Hadley. 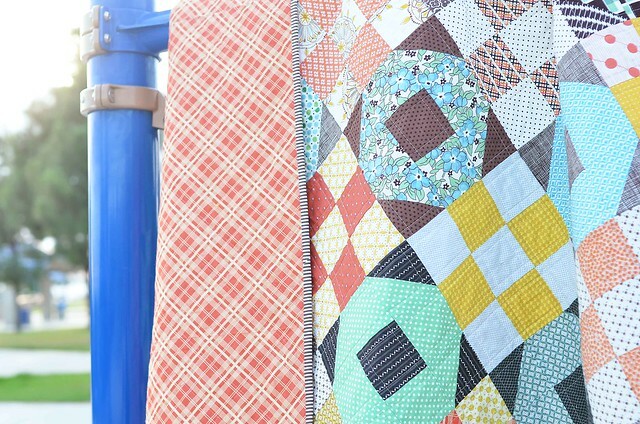 These fabrics are just brilliant and working with the Hadley prints in this quilt makes me want the entire collection. I love the versatility of Denyse's prints. 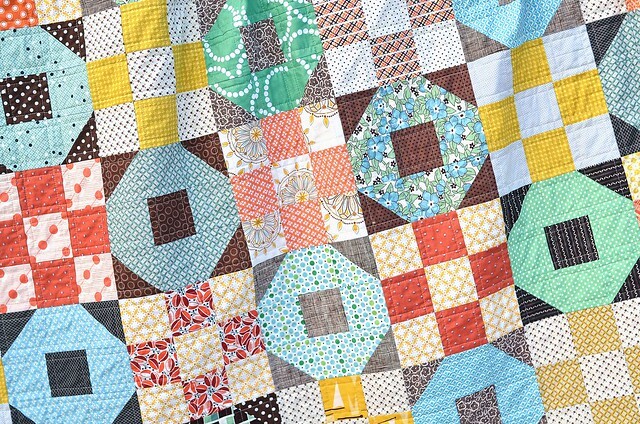 The quilt is made up of two simple blocks: a shoo fly and a 9 patch. They are set on point and I think that traditional blocks work really well with Denyse Schmidt's prints. The backing is from Chicopee and this is one my favorite prints of all time. This is actually the FOURTH time I have backed a quilt with this print (here, here, and here) and I am so pleased that it is still available (you can find a little bit here on sale!). The binding is a sadly OOP Lecien color basic brown stripe. If anyone knows where I can find more of this one, please let me know! I made this quilt with no purpose in mind, so I think I may hang onto it until I find the right person to gift it to. Finished Size: a very generously sized lap quilt at 64" x 78"
You can find a wide variety of Denyse Schmidt prints online . . . This is beautiful! Well done! I could see it working really well with her Chicopee line as well. How do you set a quilt on point? Any good tutorials you could direct me to? Thanks! Love it!! And if a suitable recipient doesn't come along, you could always send it this way!!! I loooove Hadley. The colours and prints are awesome - I just purchased the whole line hee hee. Your quilt is fabulous, keep it keep it!!! Great quilt. I like the quilting too. I love the combination of those two blocks! ...colors are super too! Great quilt. I love the traditional blocks and they work wonderfully with these fabrics. Very beautiful. Love your quilt! The fabrics play so nicely together and the pattern is awesome. You'll find the right person to give it to one day . . . . or keep it yourself, since you said it was 'you'. It´s such a lovely quilt! This is just fantastic and love your fabric combo! We are always behind you with new fabrics in the UK so I hadn't seen these before, but they are lovely and would be very versatile. They certainly work very nicely in your quilt! AAAAHH!!! Erica! It's fantastic! Makes me want to run and grab a cup of hot cocoa and a good book. :) Very nice finish! What a Beautiful combination of blocks and fabrics! A really sweet quilt Erica! Lovely fabrics, and the design complements them perfectly. So sweet! Lovely quilt! I know what you mean about fabric, too--I seldom wear the colors I like to quilt with. Nice job! Beautiful quilt! I think it's really interesting that the colors you thought outside of your comfort zone ended up being a little more "you!"